The following chapter has been contributed by the author Edward Moxon-Browne with the permission of the publishers, Blackstaff Press. The views expressed in this chapter do not necessarily reflect the views of the members of the CAIN Project. The CAIN Project would welcome other material which meets our guidelines for contributions. This chapter is copyright Edward Moxon-Browne, 1991 and is included on the CAIN site by permission of the publisher, Blackstaff Press. You may not edit, adapt, or redistribute changed versions of this for other than your personal use without the express written permission of the author and publisher. Redistribution for commercial purposes is not permitted. 5 A Decade of Enterprise in Northern Ireland? 10 Is Northern Ireland a Conservative Society? National identity assumes an importance in Northern Ireland not evident elsewhere in the United Kingdom. In Britain, for the most part, lines of ethnicity, class and religion run across the preponderant 'British' identity. That identity itself encapsulates wide variations of racial and national origin: Jewish, Jamaican, Scots, Bangladeshi and Hong Kong Chinese. For all these groups, and indeed the hundreds of other ethnic minorities living in Britain, 'British' national identity can be regarded as a primordial umbrella under which subordinate ethnic identities can co-exist with reasonable ease. In Northern Ireland, by contrast, primordial national identity is an exclusive and divisive concept. Moreover, national identity in Northern Ireland is not simply a reflection of diverse ethnicities based on successive waves of immigration. It is rooted in the colonisation of Ulster by Protestants; and, consequently, by opposing views of the legitimacy of the state and its boundaries. In Britain, political conflict is largely mediated by rules and institutions that command widespread consent; in Northern Ireland, the conflict is rooted in rules and institutions. For example, in the present survey, when respondents were asked if they thought that 'The law should always be obeyed, even if a particular law is wrong', there was a stark contrast between Catholic and Protestant responses, with almost half (49%) of Protestants agreeing, while only 28% of Catholics did so. Likewise, when asked about the death penalty for terrorism, while 71% of Catholics oppose it, only 19% of Protestants do so - the same as in Britain as a whole. Not only does divided national identity lie at the heart of the political conflict in Northern Ireland, but also it informs and underlies other social divisions, not to mention strong divergences of attitude towards many basic issues. The differences between the two communities in Northern Ireland are palpable. The lines of division tend to reinforce each other. There are few, if any, overarching institutions or foci of loyalty that can transcend the cleavages. Although the lines of division are often considered to be religious in character, religion is best seen as a badge of difference - the visible symbol of deeper and less tangible attachments to national 'roots'. These roots derive from historical events whose interpretation is itself a subject of conflict. Today, these conflicting interpretations manifest themselves in two sets of apparently irreconcilable political aspirations: unionists determined to maintain Northern Ireland's position within the United Kingdom, and nationalists aiming at some kind of all-Ireland structure. At least two major surveys have previously examined the salience of national identity in Northern Ireland. Rose (1971) and Moxon-Browne (1983) report the results of attitude surveys carried out, respectively, in 1968 and 1978. Both surveys interviewed around 1300 respondents. Rose's interviews were fortuitous in their timing: they took place a few months before the 'troubles' began in 1968. As one commentator has observed, they 'embalm for us a permanent record of attitudes in Northern Ireland at the last moment when the region was still at peace' (Whyte, 1990, p.6). The main value of the Moxon-Browne survey, carried out in the midst of the 'troubles' exactly 10 years later, was in the replication of certain key questions. The present survey asks virtually the same questions as both Moxon-Browne and Rose, but uses a slightly different set of response-categories. For example, while all three surveys ask 'Which of these (terms) best describes the way you usually think of yourself? ', the Social Attitudes survey substitutes 'Northern Irish' for 'Anglo-Irish' and does not include 'sometimes British - sometimes Irish'. Although such differences mean that findings across the three surveys can never be precisely comparable, it is nonetheless possible to draw useful conclusions from them as a series. This chapter examines three aspects of national identity in Northern Ireland: the overlap between religion and national identity; the impact of social class on national identity; and the relationship between party political allegiance and national identity. It concludes with some comments on the evolution of national identity. The dichotomy between 'British' and 'Irish' national identity in Northern Ireland might have become less sharp had it not been for high rates of intra-group marriage (that is, endogamy). Most ethnic groups show a strong preference for endogamy. American Jews and American Blacks marry preponderantly within their own group. There is an underlying fear that the ethnic group will not survive in the next generation if only one parent is of that group. In colonial situations, or where there is a stark contrast in the respective sizes of two or more ethnic groups or, more particularly, in the gender composition of the groups, interbreeding often developed and was condoned. In Northern Ireland, however, despite a Protestant majority, endogamy has been preserved. This has been due partly to an adequate gender balance within each community and partly to religious and political objections to intermarriage. By contrast, in the Republic of Ireland, where the Protestant minority is very small and the political implications of intermarriage are perceived as unimportant, much more intermarriage takes place. In any society in which the boundaries between communities are clearly defined, endogamy is frequently the single most important factor in maintaining the boundaries. In Northern Ireland, endogamy is both a reflection and a cause of strong communal identity. Rose (1971) found that only 5% of marriages crossed the communal divide; 10 years later, Moxon-Browne (1983) found the proportion to be the same, and the figure in the current survey is only slightly less (4%). The consistency of these figures reflects not only the crystallisation of the sectarian division in Northern Ireland, but a strong belief in maintaining such a division. This lends support to the conclusions of a recent discussion (Whyte, 1986) of the factors which may be responsible for delineating boundaries between the two communities in Northern Ireland. Educational segregation and high rates of endogamy were considered to be more pertinent than party political affiliations, residential segregation, economic status or membership of the Orange Order. Much earlier, Harris (1972) had found endogamy to be the single most powerful factor in maintaining the divide between the two communities in the rural area she studied. The supremely important ties of kinship never crossed the sectarian divide. The fundamental relevance of sectarian identity patterns is underlined by Whyte's observation that when intermarriage did occur, 'it bridged no gaps, for usually the husband cut off all ties with his own kin' (Whyte, 1986, p.230). This fear of 'diluting' the prime reference-point for identity points to its significance. Marriages across social class boundaries do not arouse the same negative reactions. Given the clearly delineated boundaries between the two communities in Northern Ireland, it might be assumed that national identity and religion are virtually synonymous. Indeed, 'Catholic' and 'nationalist', and 'Protestant' and 'unionist', respectively, are often used interchangeably. However, the evidence from four attitude surveys, including the present one, shows that there are important exceptions to this. It can be seen that, although most Protestants feel 'British' and most Catholics feel 'Irish', it is far from being a universal rule. 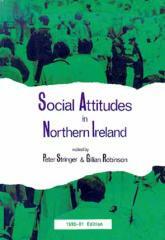 In 1968, just before the onset of civil unrest in Northern Ireland, 20% of Protestants claimed to feel 'Irish'. Ten years later, after having borne the brunt of the IRA campaign, Protestants have swung more definitely towards adopting the label 'British'. This swing is confirmed by the David Smith survey of 1986 reported in Whyte (1990) and by the present survey. If social class is a part of the Northern Irish identity, its importance is obscured, in the political domain at least, by religion. Rose (1971) found that Northern Irish people are well aware of a class structure which approximates to that found in the rest of the United Kingdom. This was true of both Protestants and Catholics. However, in response to questions about their self-identification in class terms, Protestants placed themselves disproportionately in the middle and upper classes. Even when class was assigned more objectively, there was still 'a limited tendency for Protestants to have a higher occupational class than Catholics' (Rose, 1971, p.280). This socioeconomic imbalance in favour of the Protestant community, as well as its relatively lower unemployment rates, was confirmed both by Aunger (1975) and Moxon-Browne (1983). Rose's famous dictum that there are 'more poor Protestants than poor Catholics in Northern Ireland' (Rose, 1971, p.289) was not supported. In the 1989 Social Attitudes survey, 47% of Catholic respondents ascribed themselves to the working class, compared with 33% of Protestants; and one in six Catholics and one in ten Protestants were unemployed. These figures suggest a narrowing of the gap between the socio-economic positions of the two communities. Is social class a barrier to social relationships? Rose asked his respondents whether they thought that they had more in common with people of the same class but a different religion, or with people of the same religion but a different class. Thirty-nine per cent of both Protestants and Catholics felt that they had more in common with those of the same class as themselves, irrespective of religion. Only 15% thought that they had more in common with co-religionists of a different class. Thirty-six per cent said that neither religion nor class makes any difference to social relations. In all three cases, there were no great differences between Protestant and Catholic views. Rose concluded from this that there was a sense of community among people in Northern Ireland and that religion played a relatively small role in their day-to-day lives. Religious differences only became important in the domain of politics. But, as Harris tells us, politics is normally a taboo subject in contacts between people of different religions in Northern Ireland, and great efforts are made to avoid controversial topics in 'mixed company' (Harris, 1972, pp.146-8). The Social Attitudes survey suggests that both religion and class are important in social relationships. In answer to the question 'How close would you say you feel towards people who have the same religious background as yours? ', and 'to people who have the same social class background as you? ', 65% said 'close' or 'very close' to both. Both religion and class were more important in this respect than area of residence, area of birth, or political beliefs. Rose found that political attitudes were much less affected by class than by religion (1971, pp.280-i). Within the two religious communities he found virtually no differences in socio-economic status that explained extreme or moderate political positions. In the late 1970s, however, class clearly did have an impact on national identity, political party affiliation, and attitudes towards constitutional solutions. Among Catholics, self-perceptions of being 'British' were more common among middle-class Catholics than among their working-class co-religionists (Moxon-Browne, 1983). Among Protestants the 'Ulster' label was adopted by more working-class than middle-class respondents. These contrasts are further emphasised by the social structure of support for the main political parties. The proportion of voters who were working class was greater in the Democratic Unionist Party (DUP) and Sinn Fein than in either the Official Unionist Party (OUP) or the Social Democratic and Labour Party (SDLP). Among the predominantly middle-class supporters of the Alliance Party, Catholics were noticeably more likely to see themselves as 'British' than in either the SDLP or Sinn Fein (Moxon-Browne, 1983; MoxonBrowne and Munday, 1984). The present survey found that an Ulster identity is still relatively attractive to lower-class Protestants, though as many referred to themselves as Northern Irish, an alternative that was not available to respondents in the two earlier surveys. The 'British' label is still as strong among Protestants as it was in 1978 and 1968. Among Catholics, if the 'British' label is applied, it is more likely to be by middle-class than working-class respondents. The 'Northern Irish' label is attractive to many middle-class Catholics. The reasons for class attachments to different national labels is a matter for speculation. It seems reasonable to suppose that middle-class Protestants benefit from the union with Britain more directly than those who are less well-off. The latter, and especially unemployed Protestants, would feel no great affinity with the status quo and still less with any attempts to extend political or economic opportunities to the Catholic community. An Irish identity is rejected by almost all Protestants. The more disadvantaged groups reject a British identity as well, perhaps because Britain is perceived to be acting in a way that is not conducive to the best interests of the Protestant working class. The claim to an 'Ulster' identity may be in protest against what are seen as alien 'English' policies. For the Protestant, national identity is a pragmatic issue. Waddell and Cairns (see Whyte, 1990, p.71) argue that national identity is more 'situationally determined' for Protestants than for Catholics. They cite the familiar observation that Protestants feel most Irish when 'watching Ireland play rugby'. Since the imposition of direct rule in 1972, a shift towards 'Ulster nationalism' has coincided with the growth of Loyalism. Both can be seen as a reaction to the more 'neutral' - and, therefore, less anti-Catholic policies - pursued by government in Northern Ireland since 1972. What emerges unmistakeably from the present survey is the attractiveness of the 'Northern Irish' label. As a badge of identity, it is clearly less divisive than many others. Its attractiveness rests on an inherent ambiguity. Catholics can see the label as referring geographically to the northern part of Ireland. As such it can be taken to include, say, the counties of Donegal, Sligo, Cavan, Monaghan and Leitrim, all of which are politically in the Republic. This interpretation of 'Northern Ireland' avoids any legitimisation of the border; Catholics' Irishness is thus not compromised. Protestants, on the other hand, see the term as adjectivally derived from 'Northern Ireland', the official nomenclature for a part of the United Kingdom; thereby, they do not compromise their British identity. It might be expected that the sentiment of feeling Northern Irish would be related to supporting an independent Northern Irish state. But the general weakness of support for this constitutional option and its relatively greater unpopularity among Catholics confound such a hypothesis. Support for an independent Northern Ireland has remained consistently in single figures, among both Catholics and Protestants. Asked which of seven constitutional options they would least like to see, 48% of Catholics chose an independent Northern Ireland, but only 31% of Protestants did so (Moxon-Browne, 1983, p.l05). In the 1978 survey (Moxon-Browne, 1983), a polarisation of national identity deflected party political support. Seventy-six per cent of SDLP supporters chose an Irish identity, while 71% of OUP respondents chose a British one. More interesting was the relatively stronger preference for an Ulster identity among DUP (34%) than among OUP supporters (2 1%). This asymmetry reflected the much stronger tendency for the DUP than the more moderate OUP to take 'direct action' against British government policies. The Alliance Party, befitting its trans-sectarian base, incorporated both British (43%) and Irish (29%) identities and, more significantly, a higher proportion than other parties of respondents unwilling to commit themselves to either the 'British', 'Ulster' or 'Irish' labels - 17%, as against 4%, 3% and 8%, respectively, for the OUP, DUP and SDLP. A survey of local council representatives in 1984 produced the same predictable cleavages: SDLP and Irish Independence Party (IIP) councillors were almost entirely 'Irish'. The OUP (80%) and DUP (65%) opted heavily for a 'British' identity, though one-third of the DUP described themselves as having an 'Ulster' identity. Alliance supporters were divided more or less equally between an Irish and British identity, though the largest proportion of them (36%) felt that they were 'sometimes British/sometimes Irish' (Moxon Browne and Munday, 1984). By 1989 the disparity between the DUP and OUP over Ulster identity has disappeared. Arguably, both parties have become alienated by the Anglo-Irish Agreement, and are equally anxious to resist any weakening of the link between Northern Ireland and the rest of the United Kingdom. The SDLP remains substantially 'Irish'. But about a quarter of supporters of the SDLP, as well as of the Alliance Party and Sinn Fein, are attracted by the notion of 'Northern Irish' identity. The complete absence of a 'British' identity among Sinn Fein supporters, and the 8% of 'British' respondents in the ranks of SDLP supporters, may reflect their differing faiths in the possibility of reform within existing political institutions (Moxon-Browne, 1986). In his pioneering study in 1968, Rose found that there were three national labels of importance in Northern Ireland: 'British', 'Irish' and 'Ulster'. Ten years later these had virtually collapsed into 'British' and 'Irish'. Protestants had become more inclined to see themselves as British, and less as identified with Ulster, while Catholics overwhelmingly saw themselves as Irish. The violence of the intervening period had undoubtedly made Protestants less inclined to see themselves as Irish, and more likely to cling to a British identity. This may, however, have derived from a perception that the Ulster identity was linked to a 'weak' political unit and that Britain, although constituting an untrustworthy custodian of Ulster's political future, was the stronger of the two contenders for control over Northern Ireland. The present survey shows that the polarisation between Catholic Irishness and Protestant Britishness is as strong as before. The Protestant identity may be negatively based - that is, Protestants are more sure of what they are not than of what they are; their perceptions of self-identity rest on constitutional arrangements, and not on 'being born and bred', as Rose (1971) pointed out. But it shows no signs of having weakened. The fact that more Protestants now vote for the Conservative Party in Northern Ireland than vote for the Alliance Party could be interpreted as one sign of the persistence of the British attachment in the Protestant community. AUNGER, E., 'Religion and occupational class in Northern Ireland', Economic and Social Review, 7, 1-18 (1975). HARRIS, R., Prejudice and Tolerance in Ulster, Manchester University Press, Manchester (1972). MOXON-BROWNE, E., Nation, Class and Creed in Northern Ireland, Gower, Aldershot (1983). MOXON-BROWNE, E., 'Alienation: the case of the Catholics in Northern Ireland', Journal of Political Science, 14, 74-88 (1986). MOXON-BROWNE, E. and MUNDAY, J., 'Bridges and chasms: cross-cutting attitudes among district councillors in Northern Ireland', Administration, 32, 55-75 (1984). ROSE, R., Governing Without Consensus: an Irish perspective, Faber and Faber, London (1971). WHYTE, J., 'How is the boundary maintained between the two communities in Northern Ireland? ', Ethnic and Racial Studies, 9, 2 19-34 (1986). 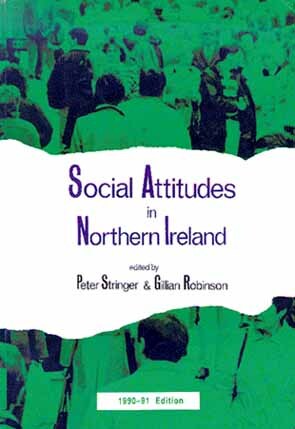 WHYTE, J., Interpreting Northern Ireland, Clarendon Press, Oxford (1990.